Have you ever started a task, worked on it solidly and then realised that you’ve barely made a dent on it? Well. That’s the situation I’m in with painting the Aegis defence lines for the Imperial Strongpoint. I sprayed all the barricades grey, which was fine and then picked up the nearest piece and started painting. This is the result. So, yesterday I caught myself procrastinating. 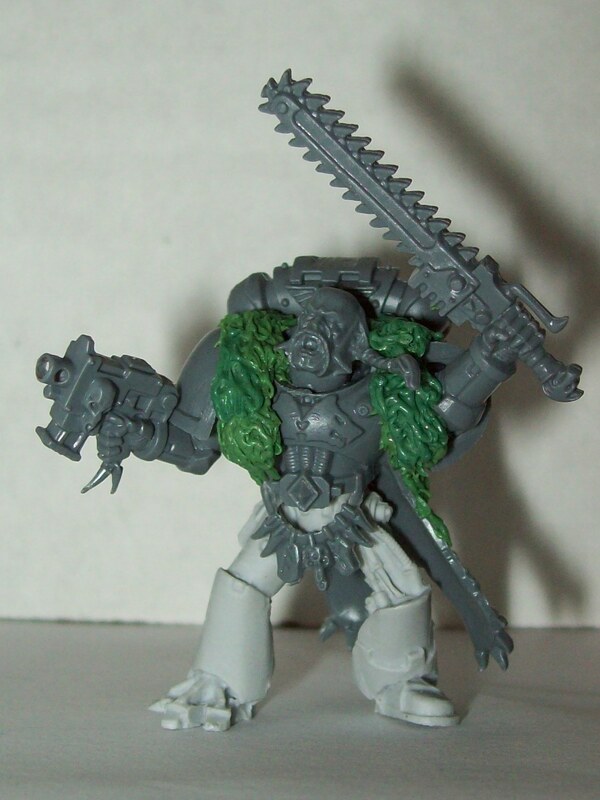 Rather than painting barricades, I built a Long Fang Squad Leader using various bits from the Devastator box, the Space Wolves Pack box and the Iron Hands upgrade kit, oh, and lots of green stuff! The legs are still separate as I don’t think that I’ll be able to get at all the detail otherwise (and all my super glue lids have glued themselves onto the bottles). I was originally planning on using a fur trimmed pauldron on one arm but, when I went to stick it on, I realised that the fur would be sticking out at a stupid angle. I guess that’s the difficulty with all of these beautifully decorated extras. They do look good, but they really can only go one way, otherwise any dangly bits appear to disobey gravity. I decided today that as I wasn’t making any progress on the barricades I’d do some more work to reduce the painting backlog. 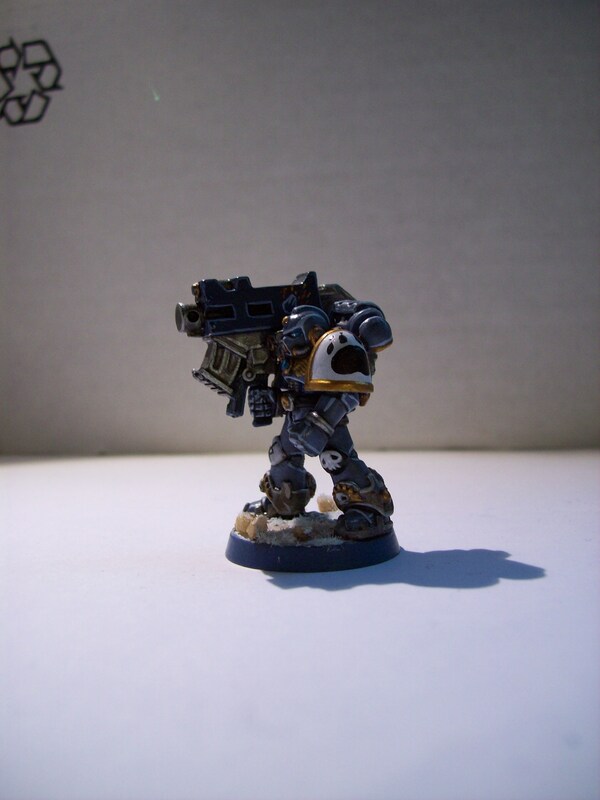 I have one Wolf Guard Terminator that has been sitting glued together undercoated but otherwise unpainted for months now. In my last game (my only game of sixth ed. so far) he was pretty awesome, surviving almost all that was thrown at him (I was tabled) for quite some time, so I felt that it really was time that he got at least a lick of paint thrown at him. I’ve nearly finished the layering part now, so I hope to get him done this week, which will be nice. It would be nice to get him done before my birthday at the end of this month as I got the kit as a birthday present last year! Apart from that, I’ve been doing a bit of reading. I have been reading First Heretic by Aaron Dembski-Bowden, but although it is a great book I haven’t been able to pick it up to finish it off. I think it’s because I’m tired. It’s a book full of strong feelings and big concepts and I’m spending my work week struggling to deal with a new topic, so I’m mentally very tired, which means that I haven’t got the energy to finish it, particularly as I’m beginning to remember what is about to happen in the story. So, rather than struggle on with it now, I’m taking a break from it until I can really get back to reading it and I’ve been reading Rynn’s World by Steve Parker instead. I like Rynn’s World, which is why the book is beginning to fall to bits. It’s not the best written of the Space Marine Battles series, but it’s fairly decent and stars Pedro Kantor and Pedro Kantor is just, well, awesome. I think I need to do a bit of book shopping again. I have a list of all sorts of books that I want but that I haven’t got round to getting. Perhaps a good book will help get me back into a painting mood. Perhaps next week I can reward myself for getting another one of those flipping barricades finished! Sorry, I’ve been a bit quiet this week. No excuses, I just didn’t do much! What I did do this weekend is start a Rune Priest conversion. 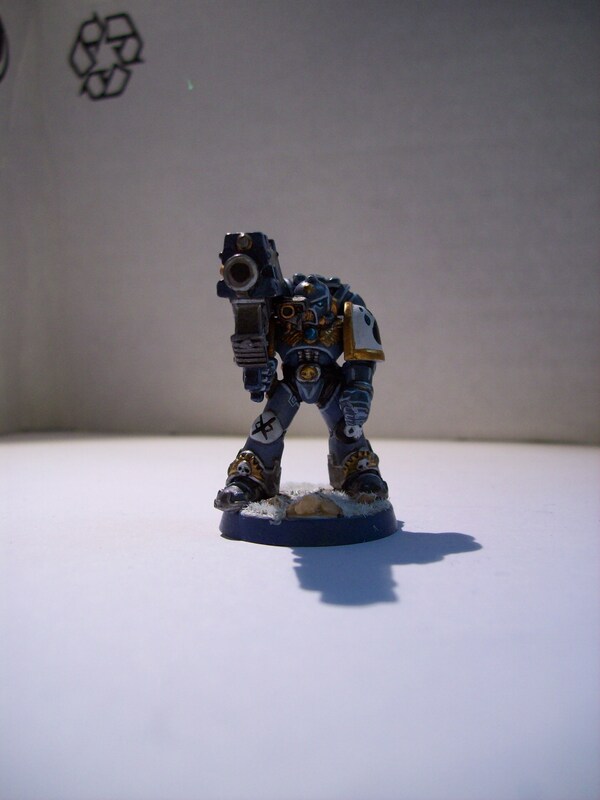 It all started when Commsnake over on The Overlords forum initiated a modelling challenge. I’ve been thinking about a Rune Priest for a while and as my Iron Hands bits have been returned to the shop, I decided that it would be perfect for the challenge. 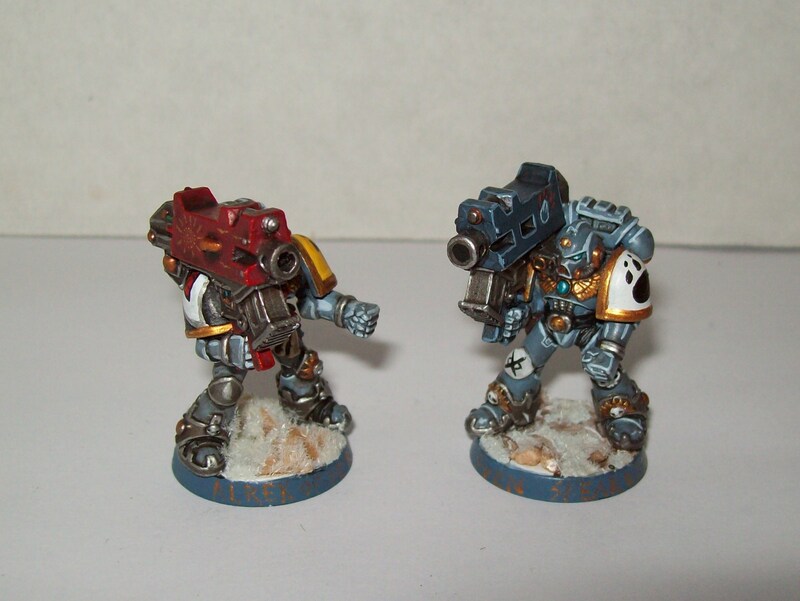 I’ve used bits from the Space Wolves pack and the Devastators kit (because they’re plainer). I reposed the legs so that he looks a little more dynamic (I hope). I used a power sword arm for the staff. I removed the sword and drilled out the hand so that I could insert a length of pinning rod. 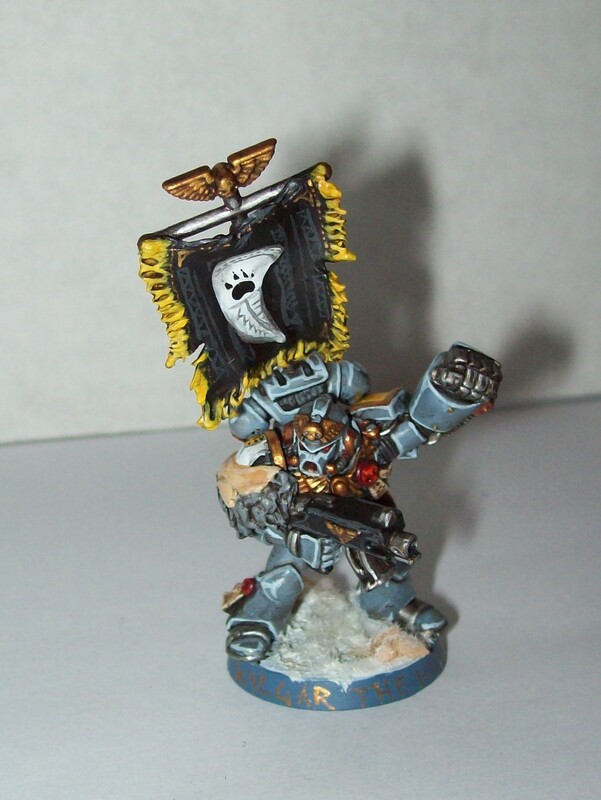 The eagle on top of the staff was taken from the banner in the Devastator kit. I’d spent ages trying to make one until my boyfriend pointed out that there should be one in the kit. The character is called Ratatosk after the squirrel in Norse literature who spreads gossip between Nidhogg, the serpent at the bottom of the World Tree, Yggdrasil, and the Unnamed Eagle at the top. 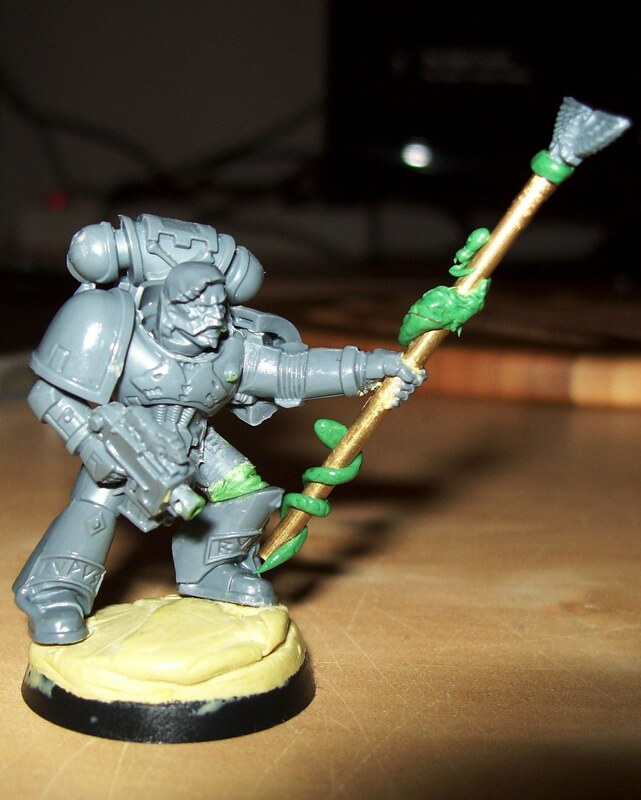 Therefore I moulded a snake and a squirrel (badly) onto the staff with Green Stuff. There’s still a lot to do with this model: I need to add more detail to the staff and give him pelts and cloaks and things. I’m also going to add to the hair to make it look a bit more wild. Still, it’s a start, and it should keep me occupied in the weekends for a bit! Oh! I should add that I’ve added a blogroll to the blog. There’s only one entry so far, but I’ll add more in time! 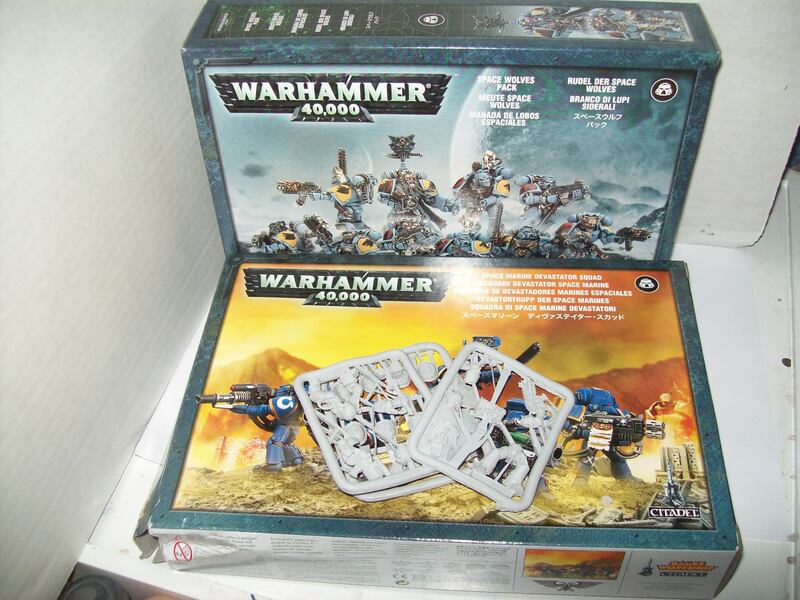 I’m going to use the Iron Hands Tactical Squad upgrade pack for bionics for my Long Fangs which will be based round the Devastator kit and bits from the Space Wolves Pack box. I’m not sure what to make of the Iron Hands kit. I’ve never used Finecast before and so far I’m not impressed. Perhaps it’s because I’ve been painting metal and plastic all week but the texture feels rather strange. The sprues themselves look like the shoulder pad that I accidentally dipped in acetone- they’re very rough and look a bit warped. There’s lots of extra sprue and a thin layer of resin joining a third of one sprue together. There are also a lot of bubbles in the sprues. 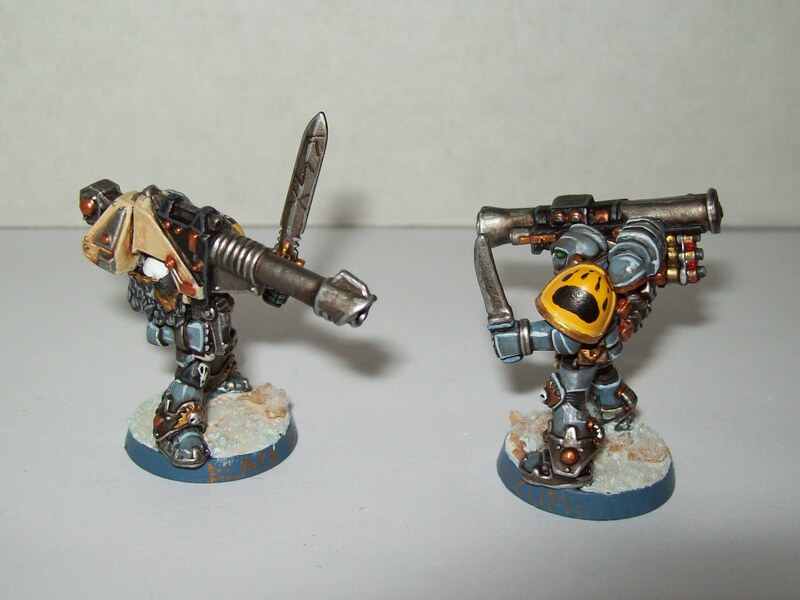 They’re particularly visible on the shoulder pads but they are present elsewhere too. The whole thing looks very rough. On the other hand the kit does contain two sets of bionic legs, two sets of bionic arms with bolters, a bionic arm holding a thunder hammer, two (badly cast) chest pieces, four helmets and ten Iron Hands shoulder pads. 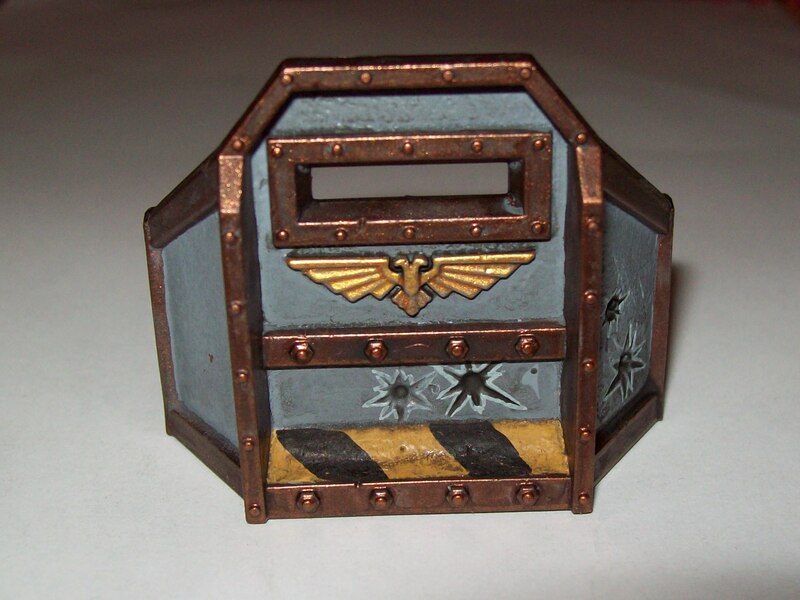 I think that next time I will just get the Forgeworld Space Marine Character Conversion kit, as although you get less for more money, at least it’ll be all usable without the hours of filling and sanding that the Finecast kit looks like it’s going to need. I’m going to put the sprues away for a bit though, at least until I make a bit more headway with the painting queue! 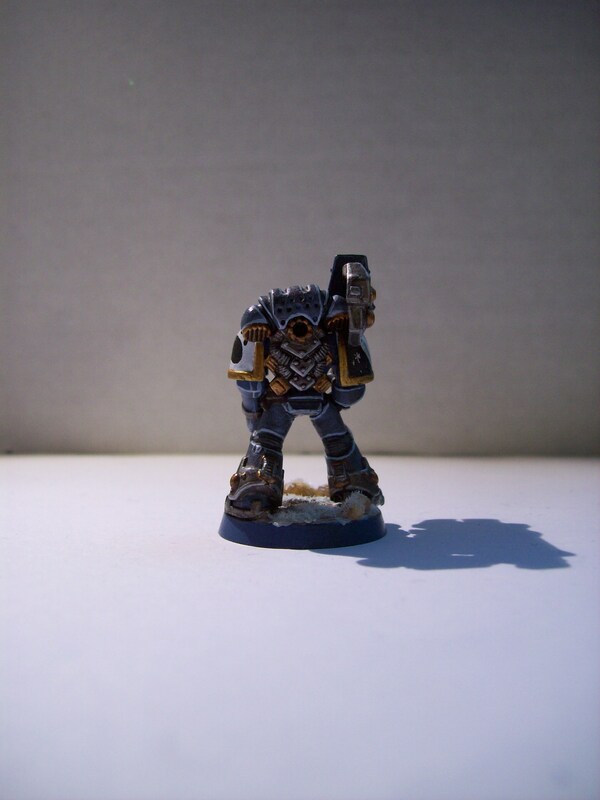 I’m rather tired this evening, but I felt that the last post was rather too short so I thought I’d put up a progress report for my Space Wolves. I’ve got rather a lot going on at once at the moment, so this list is as much for my benefit than the blog’s! 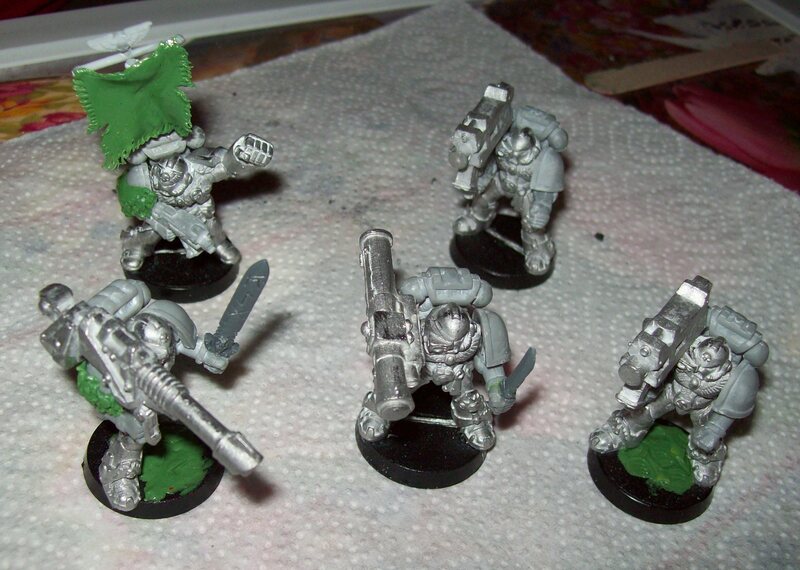 First off I have undercoated my scouts, at least partly so. I don’t have a garden so spraying gets difficult. I managed two coats yesterday and I’m going to touch it up with the new Imperial Primer, which may be interesting. Hopefully I will finish priming them this weekend, although part of my reason for getting the spray cans out was to stop me adding more to them. Painting-wise this weekend I want to finish my last three (for now) Fenrisian wolves. I’m hoping to talk about them in detail another day, but I need to finish them first. I also need to finish highlighting my Blood Claws. I still have six to go and because they’re almost done I tend to forget that they’re there. 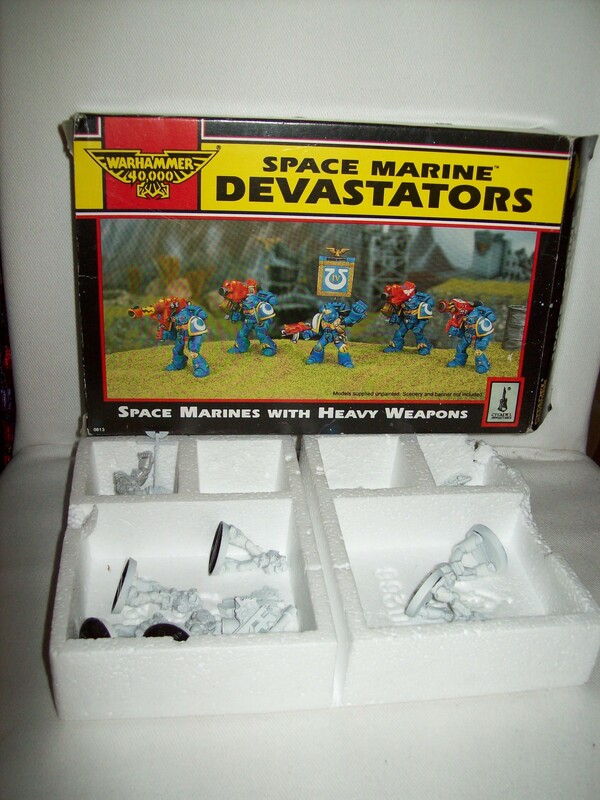 The other thing that I plan to do this weekend is strip the old undercoat off the old school metal Devastators that I acquired from my boyfriend during our last trip to the UK. 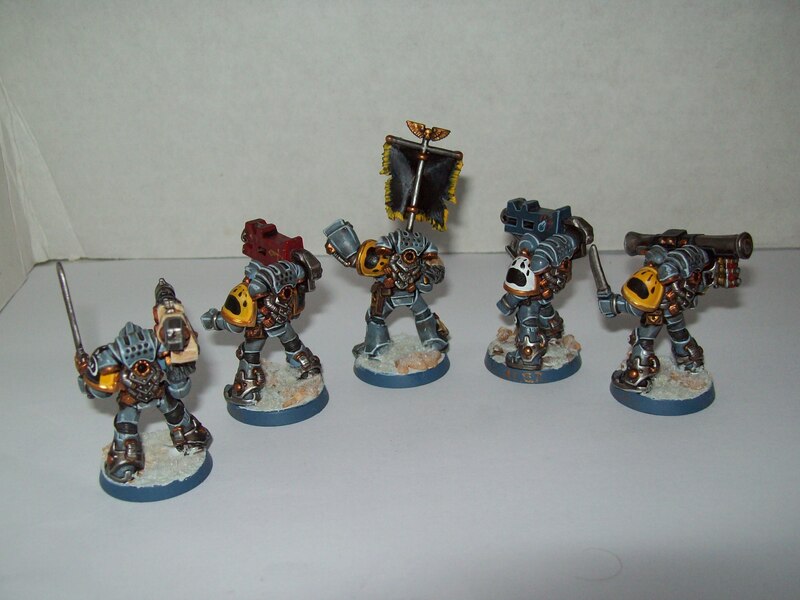 I don’t know why he never used them for his Blood Angels, but they look kind of fun, especially with the shoulder mounted weaponry. 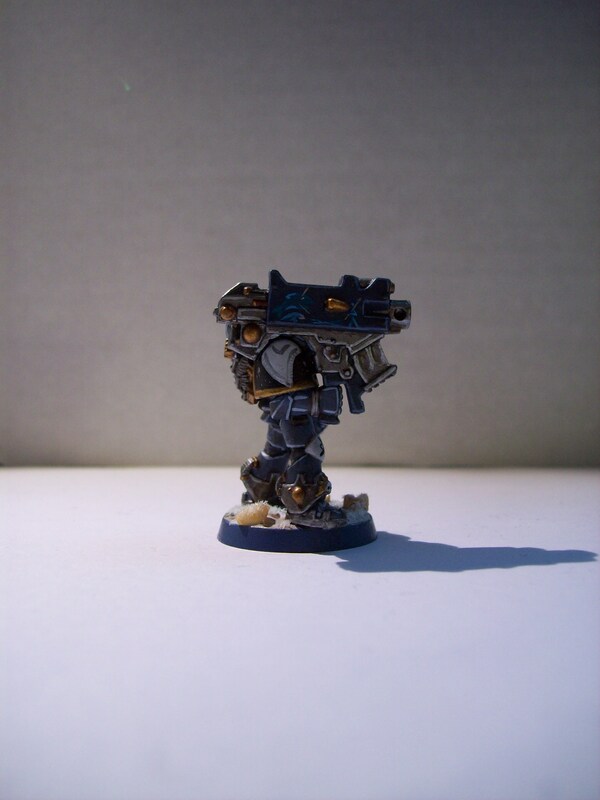 I might not paint them in the style shown on the box though! 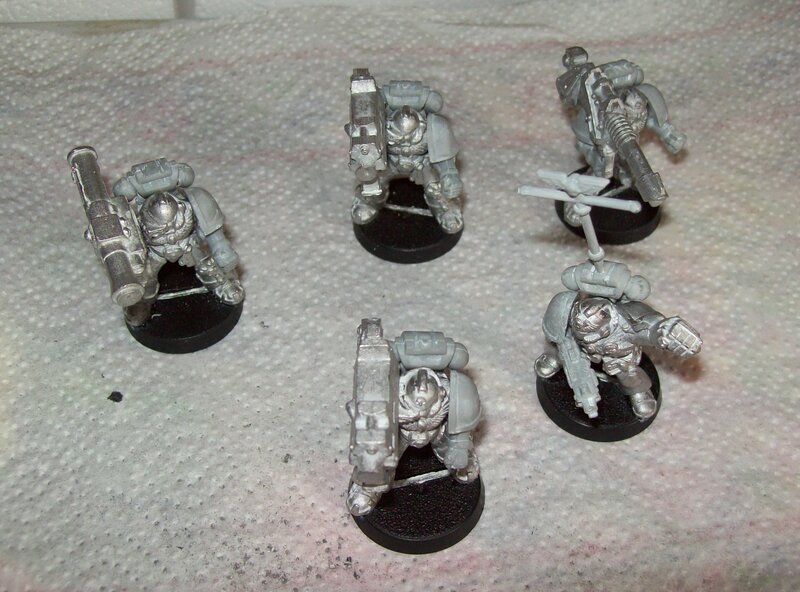 Beyond that I have two other primed models to consider- a Wolf Guard Terminator and a Land Speeder and there’s also a Land Raider that I need to think about. I guess that I might wolfify it with greenstuff and wolf skulls, but it requires some planning. 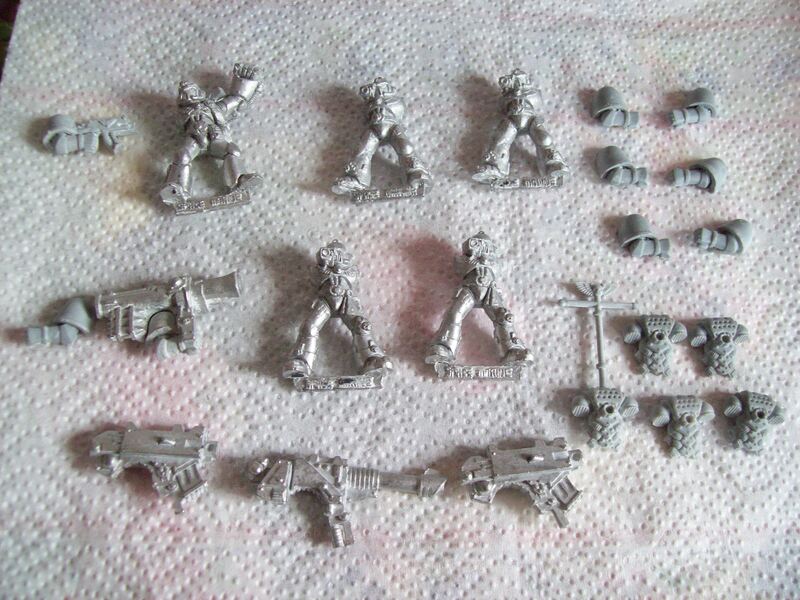 What I am not going to do is buy more models, at least not until I have made some inroads into the pile. With all the talk of Chaos Legions on the internet I have been looking at various models and I’m very tempted to start a painting project involving Chaos Marines, especially as I am partway through re-reading the Horus Heresy books and all the old legions are fresh in my mind. However I have too much to do and too much of a pile on my painting tray as there is. 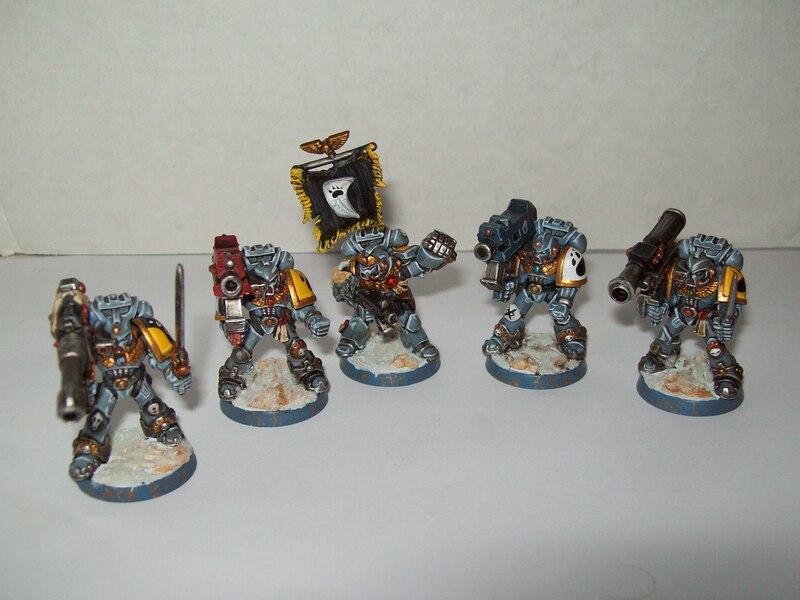 I also need more guys for my Space Wolves as even I know that my army needs some tweaking! Chaos Marines will just have to wait.